Israel is a small country located in Southwest Asia, only 29,000 square kilometers in size, and yet it is a place of amazing variety and interest. Israel's location, bridging Africa, Asia and Europe, makes its geography unique, with desert in the south and snow-capped mountains in the north. Its temperate climates, vast array of beaches, rich history and culture, unique geography and religious significance attracts millions of visitors each year. 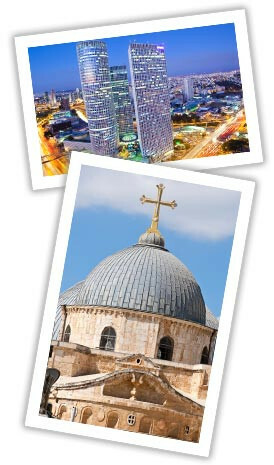 Israel is home to a multitude of Christian holy sites and shrines. Take the Via Dolorosa passing the Stations of the Cross to the Church of the Holy Sepulchre, the ancient site of the crucifixion and burial of Jesus. Continue to Mount Zion to visit the Church of St. Peter in Gallicantu, the Room of the Last Supper and the Church of the Dormition. Jerusalem is also home to the Yad Vashem Holocaust Memorial and the Israel Museum, which holds the Dead Sea Scrolls and many fascinating exhibits. Tiberias and Safed, considered two of Israel's sacred cities are home to the burial sites of great rabbinical leaders and contain many interest points. Safed is the birthplace of Jewish Mysticism and the home of the Ari Hakadosh. Tour & Smile is pleased to announce our new partnership with Israel's leading tour operator - Shalom Israel Tours. Shalom Israel Tours is a wholesale tour operator based in Jerusalem; we create amazing experiences for communities and families visiting Israel.